LITTLE FALLS, N.J., October 10, 2018	(Newswire.com) - Bloomfield Cooling, Heating & Electric Inc., located in Little Falls, New Jersey, has earned the Carrier 2018 President’s Award in recognition of its high level of customer service and expertise in all aspects of heating, ventilation and air conditioning sales, installation and service. The family-owned and operated HVAC company is a long-time, multiple-award-winning contractor, serving homeowners throughout northern New Jersey. 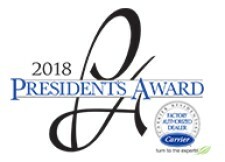 This is the second time that Bloomfield Cooling, Heating & Electric has won the Carrier President’s Award, which joins the multiple Angie’s List Super Service awards and “Best HVAC Contractor” gold medals in the Best of Essex Readers’ Choice Awards sponsored by Vicinity Publications. Bloomfield Cooling, Heating & Electric offers homeowners a range of HVAC solutions, including ductless heating and cooling systems. Its certified technicians install natural gas furnaces and convert oil heating systems to natural gas; service hot water, steam and gas furnaces; install and service standby generators; and install the latest mold remediation and humidification devices. As its name implies, Bloomfield Cooling, Heating & Electric is also a licensed electrical contractor, providing all the electrical services related to HVAC installations and service as well as many home construction and home renovation needs. For a consultation or service, contact Bloomfield Cooling, Heating & Electric Inc. at 973-237-0505 or info@bloomfieldcooling.com. For more information about the company’s HVAC and electrical services, visit www.bloomfieldcooling.com.